Methods of analysis. We modeled the distribution of BPA exposures among infants who are exclusively bottle-fed, considering two populations: infants fed ready-to-eat formula, and infants fed concentrated formula assumed to be diluted with BPA-free water. We modeled single-day exposures for infants from birth through 4 months of age. For each infant modeled, BPA exposure was calculated as the product of BPA concentration in formula and the total daily volume of formula consumed for that child, divided by the child's body weight, for final units of micrograms of BPA consumed per kilogram of body weight. The source of data for each of these model parameters is described below. Daily formula consumption. To represent infants' daily formula consumption we used data from USDA’s Continuing Survey of Food Intake by Individuals (CSFII) on exclusively formula fed children ages 0 to 4 months old. We did not use consumption rates that appeared well outside the typical range represented by the data, including consumption rates for 6 children with daily intake nearly or more than double the median intake of 32 oz/day (>60 oz/day), and 3 children with consumption rates about 70% or less than the median (<90 g/kg bodyweight or < 20 oz/day). Body weight. For infant body weight in our BPA exposure model we relied on body weights for infants from birth to age 4 months in CDC's National Health and Exposure Survey (NHANES). 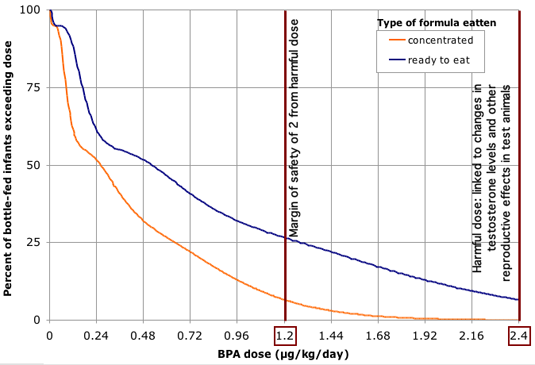 BPA concentrations in infant formula. In our exposure model we relied on BPA concentrations from two studies, one published by FDA in 1997 (Biles et al. 1997), and one published by EWG in 2007 (EWG 2007). In the model we treated non-detects as 1/2 the level of detection (LOD). Modeling procedures We created BPA exposure distributions for infants from birth to 4 months of age as the distribution of exposures created by all possible combinations of consumption rates and age- and gender-matched body weights with each of the 20 measured BPA concentrations in the 2 test programs included in our analysis. The distribution of BPA exposures for infants fed ready-to-eat formula were based on the BPA measurements reported by FDA and EWG, while BPA exposures for infants fed concentrated formula were based on reported BPA measurements divided by 2 to represent water dilution (caregivers typically dilute formula concentrate with an equal volume of water prior to feeding). Figure 2. Model results show significant numbers of bottle-fed infants exposed to BPA at levels near or above those that harm lab animals.